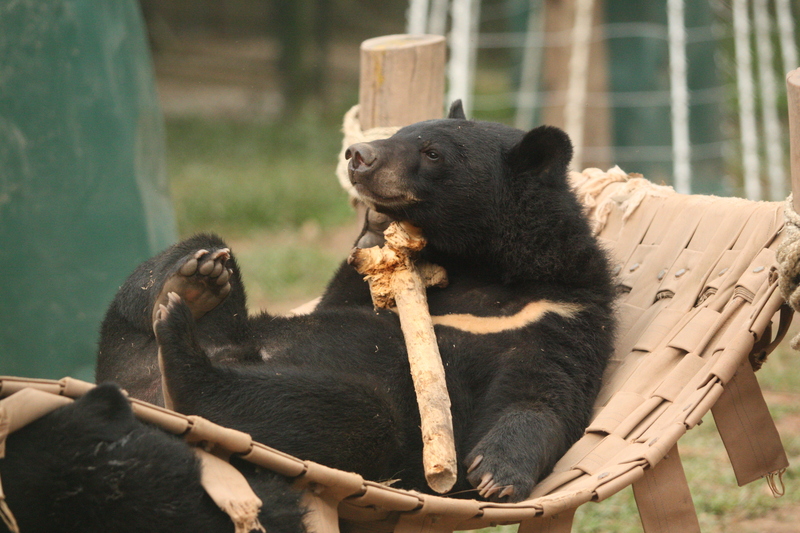 Fortunately, the Forestry Protection Department of Vietnam’s remote north-western Son La province caught the traffickers and called Animals Asia to rescue Taz. While one of the cubs sadly died shortly before Taz was rescued, he and best pal Peter Robert Baynes survived. Despite being so young, little Taz was already showing signs of stereotypic behaviour – repetitive actions representing stress – something quite unusual in such a young animal. But today all that is the past. Taz was given a clean bill of health in 2013 during his medical and has established a reputation as a cheeky, mischievous bear who loves wrestling with his mates. As he’s grown so have his surroundings and circle of friends, as he and Peter Robert Baynes are progressively integrated with other bears in larger enclosures in Animals Asia's Vietnam Bear Rescue Centre. Taz and Peter Robert Baynes’ first integration with other bears was with Georges and Baruffa. After some initial checking out of each other's den smells and living areas, the quartet very soon couldn't resist a wrestle and quickly looked the best of friends. From then on they spent their days playing like a gang of four mischievous bear cubs should. Since then, Taz’s social world has grown still further to include three more juveniles in a still larger enclosure. The magnificent seven have revelled in increased numbers of higher climbing structures and all love a dip in the pool on a hot day.